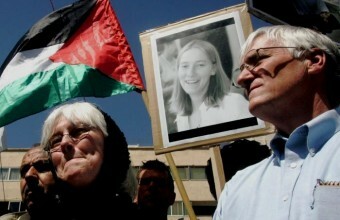 An armed group attempted to kidnap the parents of Rachel Corrie, who was killed by a bulldozer of Israeli Occupation Forces in Rafah in March 2003, while she was attempting to stop house demolition. The Corries are visiting the Gaza Strip to express solidarity with the Palestinian people. They visited PCHR on Tuesday. The kidnapping attempt failed and the parents were not hurt. These incidents took place after the PNA had arrested 'Alaa' al-Hams, 33, from Rafah, accusing him of kidnapping Kate Burton, a British citizen, and her parents last week. The protestors demanded the PNA to release al-Hams.